PDFxStream is used by the most demanding software development organizations to extract text, images, and form data from billions of PDF documents every year. Available on Java or .NET, PDFxStream provides complete PDF compatibility and unbeatable performance integrated into your application in 10 minutes or less. Enjoy the simplicity of a single, unified API, while paying only for the capabilities you need. Just download PDFxStream for Java or .NET to use these examples as the foundation for your own PDF data extraction solutions. PDFxStream is used by companies and governments around the world to process billions of documents yearly. Java or .NET, PDFxStream is available wherever you need to be. PDFxStream for Java is written in 100% pure Java, with no native components or dependencies. Its only requirement is a compliant Java 1.5 (or higher) JVM. PDFxStream is suitable for use in demanding desktop and server applications, including those with significant concurrency requirements. It has been designed to be amenable to parallelization, so that you can fully utilize your hardware and infrastructure investments when processing PDF documents without worrying about locking or race conditions. Of course, being a Java library, PDFxStream may be used by any JVM language that supports interoperability with Java APIs, including Clojure, Scala, Groovy, JRuby, Jython, and so on. PDFxStream for .NET is produced by translating the standard PDFxStream for Java binary into a pure managed .NET 2.0 assembly. This translation process is complete, and does not entail any side effects that impair its functionality, robustness, API's, or performance. All of the concurrency and parallelism guarantees provided by PDFxStream for Java apply to its .NET cousin. 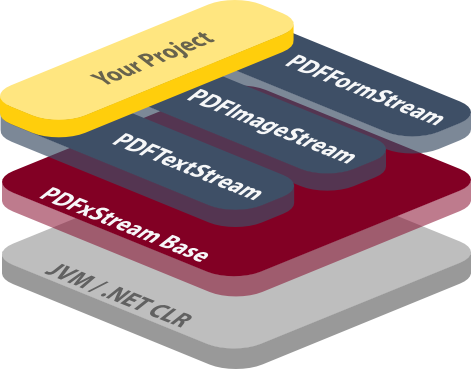 PDFxStream for .NET may be used by any .NET language, including C#, VB.NET, F#, managed C++, and so on. Full details of PDFxStream for .NET are available here. PDFTextStream is the fastest component available for extracting text and metadata from PDF documents, period. PDFTextStream has two main goals when it extracts data from a PDF document: do it accurately, and do it fast. Which of those two attributes is more important to your application is something only you can decide. However, in many environments, text extraction performance isn't just a nice-to-have: it's critical to your project's success. That's why we're glad to be able to make such a bold claim without reservation, and we have the numbers to back it up. PDFxStream Base is the foundation upon which all other PDFxStream features are built. It implements basic PDF file capabilities, and provides access to the simplest pools of data in PDF files. Having one dependency and one API to satisfy your PDF data extraction requirements simplifies project management and minimizes development costs. Even so, you only need to pay for the components you use. There's much, much more to the PDFxStream API than we can reasonably list here. Check out the PDFxStream developer's guide and API reference to learn about all that PDFxStream has to offer. The official PDF file format specification (published by Adobe) is large and complex. PDF files can be rich, dynamic documents, and getting to all of the interesting and useful parts of them (i.e. their content, text, metadata, etc) is a daunting task. Further, Adobe's specification only provides normative descriptions of how PDF documents should be constructed. Experience shows that applications must often process PDF documents from multiple sources, each of which may (and do) generate PDF files that sometimes bend and often break the "official" PDF specification — similar to how web browsers are forced to support broken and malformed HTML documents as best as they can. This is just one of the many reasons why continually supporting and maintaining PDFxStream is a never-ending task. Doing anything else would prevent us from guaranteeing maximum compatibility with all PDF document formats and variants "in the field", regardless of their source or to what degree they violate certain rules of good PDF file format etiquette. The range of PDF file format features (and quirks!) that PDFxStream supports is broad and deep. To the right is a partial list of the major facets of the PDF specification that PDFxStream supports. If you are aware of a particular detail that is not listed, then please feel free to contact us to confirm that PDFxStream supports what you need. Compatibility with all versions of the PDF document specification, from v1.0 (corresponding to Acrobat 1) to v1.7 (corresponding to Acrobat 8 and higher). All of the other components that comprise PDFxStream build on top of PDFxStream Base's foundation. If you've gotten this far, PDFxStream may be perfect for your project.